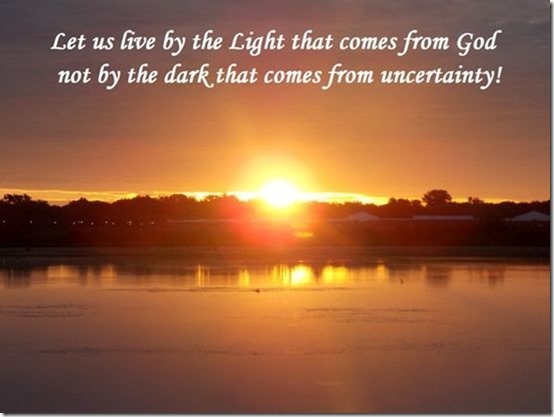 Let’s revisit light this morning. In some circles knowledge is understood as light. For example when the solution to a problem suddenly becomes known we may say something like, “Well, the light finally came on,” or something similar. “For You are the fountain of life …” First, there is no life apart from God, while there will no doubt be evidence of life it is a life lived today and gone tomorrow. “…the light by which we see.” And secondly with God’s Light we can see not only his goals for our lives but also the resources he blesses us with to accomplish those goals. Anyone living in the Fountain of God’s Light will see the senselessness of living on their own terms and give themselves over to God’s terms. Up in heaven God’s gotta Light! And on the earth he lets it shine! Down on earth God’s gotta a Person! And in God’s Person He lets His Light shine! But sadly, not everyone lives in the Little Light of God!